AbeDraws: Day 58: Single-celled and ready to mingle! Day 58: Single-celled and ready to mingle! Cell are quite fascinating. They are nothing but one cell, but there are so many function, shapes, colors and sizes. Good night! 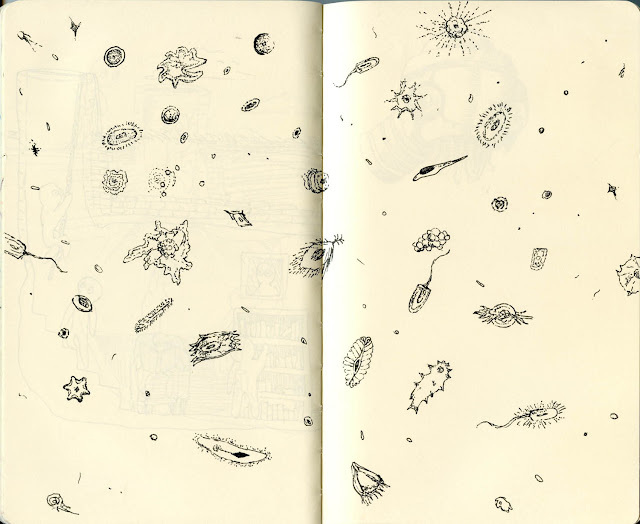 Are these all real cells that you either looked up or randomly happened to know the shape of? Or did you just make them up? I actually Googled quite a few. I got distracted learning about the largest single-celled organism (http://en.wikipedia.org/wiki/Valonia_ventricosa). I tried my best to keeps the sperms to a minimum. The ones with the tails are protozoa, i think.